Although Rhennthyl is the son of a leading wool merchant, he has spent years becoming a journeyman painter. With his skill and diligence, Rhenn stands to be considered for the status of master artisan. 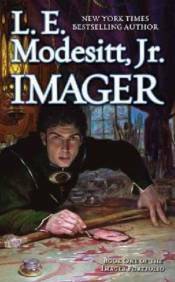 Then, his entire life is transformed when his master patron is killed in a flash fire, and Rhenn discovers he is an imager�one of the few in the entire world who can visualize things and make them real. He must leave his family and join the Collegium of Imagisle. Imagers live separately from the rest of society because of their abilities (they can do accidental magic even while asleep), and because they are both feared and vulnerable. In this new life, Rhenn discovers that all too many of the �truths� he knew were nothing of the sort. Every day brings a new threat to his life.